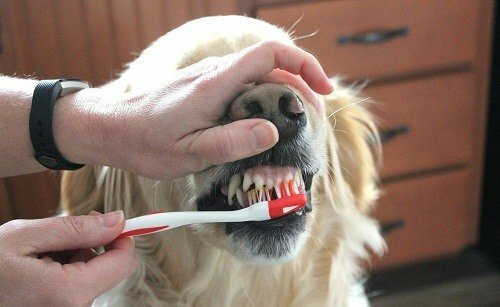 Cleaning your dog’s teeth is a tricky but important part of dog ownership. According to a study by Vetstreet.com, 85% of all pets have periodontal disease by the time they reach 3 years of age. Therefore, ensuring your canine’s teeth are fresh, clean, and most importantly healthy, is not something you can afford to overlook as a responsible owner. The first step you’ll need to take in your quest to keep your dog’s teeth clean is to pick out a good dog toothpaste. In this article, we’ll discuss what makes for a quality toothpaste for dogs and conclude with 5 of the best dog toothpaste choices for clean and healthy canine teeth. Similar to regular human toothpaste, there are some important things you want to look for when selecting a dog toothpaste for your canine. The main concern is looking for ingredients that will avoid the buildup of plaque, which happens when bacteria build up on the teeth, turning from a soft film into hardened material if not regularly cleaned away. Over time, this can lead to tooth decay as well as problems with the gums such as gingivitis. The best kinds of toothpaste for dogs must also be formulated for animal consumption only. Tempting as it may be to simply reach for the Colgate as you do yourself, your dog requires tailored ingredients that will target their individual issues without doing any harm in the process. Dog toothpastes are also formulated with tastes and textures your dog is more likely to appreciate, not to mention they must also be non-harmful if they swallow some, which let’s face it, is inevitable with a dog. Then there is tackling the breath issue. Your dog most likely eats and licks pretty much everything in sight, so it’s no wonder halitosis is quite the issue among our canine friends. The dog toothpaste you select should have breath control as one of the features as inevitably if the breath is not made fresher, you are more likely to discontinue use of the product or have to try another brand instead, which is added expense on your part. When it comes to the cleaning itself, you are also going to need a soft-bristled toothbrush specifically designed for dogs. Some brands of dog toothpaste may sell accompanying brushes or even have one included in the pack, though it’s worth considering your dog as a complex set of different teeth to clean. Remember, some will be hard to reach right at the back of the mouth and as a result, these teeth are often the first to show signs of decay. Therefore, your toothpaste and the brush itself both need to be suitable for this complex, but important job. It’s also worth noting that the sooner you introduce teeth cleaning into your dog’s routine, the easier it will be for your dog to become used to it; therefore, effective dental hygiene becomes the norm. It is easy to neglect teeth cleaning as it can be a hassle or rely on so-called dental sticks, though nothing can replace proper teeth cleaning with a brush and specially designed toothpaste. 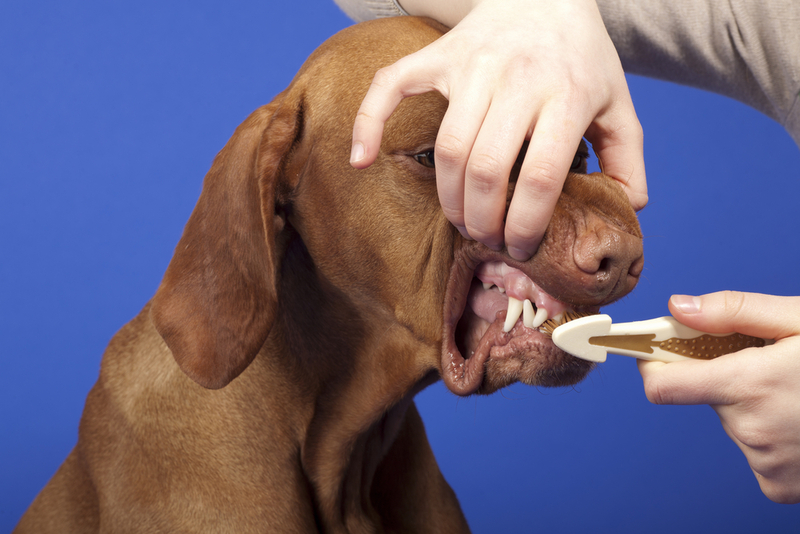 Though like many aspects of your dog’s care, teeth cleaning is for life and it regularly needs to be done. Therefore, as an owner, budgeting for dog toothpaste and any accompanying tools you may need should be a consideration. One option could be to buy products which are sold in bulk which will prove of greater value than individually buying. You can also look for toothpastes that package cleaning tools in with the toothpaste, which reduces the need for additional spending. Ultimately, your dog needs to have fresh, clean and most importantly, healthy teeth, so they can eat, live, and grow normally, free from pain and disease. A healthy dog is a happy dog! This Virbac toothpaste is recommended and indeed used by vets; therefore, has a clinical appearance from the look of the box as opposed to a more consumer-based appeal. This particular toothpaste has also been used by owners who have faced hefty teeth cleaning bills at their vets, and who wish not to repeat this costly experience without scarifying the dental health of their dog. This toothpaste is so effective that even placing it around the dog’s individual teeth can make a huge difference due to the formula which uses enzymes to break down the bacteria, as opposed to the physical scrubbing motion. Being poultry flavored it’s sure to be a winner with your pooch, and this particular toothpaste can also be used by cats too. Though don’t be alarmed at the flavoring as this product will actually help neutralize odors caused by bad breath ensuring your dog’s breath is fresh and clean. While it’s difficult to find any downsides with this product, it doesn’t mention if it’s suitable for improving gum health or indeed treating gum issues. However, you could also argue that by using a veterinary-recommended toothpaste, it will drastically help to avoid gum issues from occurring in the first place. A product recommended by a vet is a product to give serious attention to, so if you choose this Virbac C.E.T. Enzymatic Toothpaste, then take comfort that your vet would approve. While it doesn’t mention the treatment of existing gum problems as one of its benefits, it does contain a powerful enzymatic formula which will help irradiate plaque buildup, even if you struggle to reach all the teeth with the brush. Therefore, by getting this issue under control, it will help prevent gum issues from occurring in the first place. There have been many owners who have used this toothpaste after facing expensive teeth cleaning bills, and have found with regular use they have not had to go through that experience again, as this product has been more than sufficient to keep their dog’s mouth healthy and free from disease. Finally, being suitable for cats is a huge plus given the expense of taking care of our animals. Therefore, if used effectively it could greatly reduce your vet bills and keep both pets happy and healthy. The Petrodex enzymatic toothpaste is one of the highest rated toothpastes for dogs based on customer reviews, with a high percentage of customers giving this product a favorable rating. Similar to the Virbac, this dog toothpaste also has an enzymatic formula, meaning it’s the composition of the toothpaste itself rather than physical scrubbing which is the most effective part of the product. If you are looking to avoid expensive veterinary teeth cleaning bills, then this toothpaste will certainly help. A great tip is to introduce brief scraping of the teeth into their nightly routine after brushing and grooming so they are relaxed. By doing it in brief stages, you will ensure your dog does not dislike the experience and it is a good way to ensure overall dental hygiene. Because of the enzymatic formula, even rubbing this toothpaste onto each tooth will be of great benefit towards the fight against tartar and plaque buildup. The formula is poultry flavored, which is something your dog will appreciate as not only does it taste great, it won’t make them sick if they swallow some, due to the fact it is also non-foaming. This is one of the main differences between human and animal toothpaste, as typically humans do not swallow foaming toothpastes as we can read the label to see not to. However, with a dog you must ensure you are using a formula which will not harm them if they do swallow it. Ink on packaging prone to rubbing off on owner’s hands, so be careful! Petrodex Enzymatic Toothpaste is an effective toothpaste for your dog’s dental needs and one which tastes great too, although you may also need to purchase additional tools such as brushes or scrapers if your dog has a more ongoing problem. It doesn’t contain any foaming ingredients so you know it’s safe to use even if your dog swallows some. You might want to also give them a little to try first so they associate the taste with something positive rather than something they will hate having done. Value wise, being able to purchase in bulk means even if you are on a budget you don’t have to scrimp on taking care of your dog, so can cut down the cost of what can be a very expensive experience. Paws & Pals have got everything covered to set you up for a great doggy dental routine. In this twin pack, you’ll also receive a double-ended toothbrush, with different sized heads to reach the more difficult spots; it has a rubberized brush for more sensitive areas. Both of these tools will greatly enhance the results of the product, and will also help to dislodge bacteria and plaque on the teeth before it becomes anything more serious. The toothpaste itself, once again, contains an enzymatic formula and, in conjunction with the supplied brushes, will give added protection against buildup, meaning if used effectively and regularly, it will cut down the need for professional, not to mention expensive teeth cleaning performed by your vet. Onto its flavor—this beef-flavored toothpaste is something your dog is sure to enjoy especially if something so vital for their health and well-being actually tastes like a treat! Surprisingly there were also a few canine testers who did not appreciate the taste, though overall the taste was a big hit with dogs. The packaging of this product also is very appealing and definitely looks like a dog toothpaste and not a regular human toothpaste. While this might seem like a nonentity, you could argue the other two toothpastes look no different to a human toothpaste on the face of it. Every aspect of Paws & Pals has been thought out to want to make owners use it; therefore, the dog is more likely to benefit too. Paws & Pals Pet Wash Toothpaste would be an excellent starter kit for anyone new to brushing dog teeth, especially if your dog is still a puppy and you are looking to introduce the practice at a young age so they become used to it. However, at any age, this toothpaste and the accompanying tools will give you everything you need to not only clean your dog’s teeth but also help dislodge any forming plaque or troublesome spots. The formula and taste are a hit with the majority of dog testers, and the whole brand aesthetic is appealing to owners. On the whole, Paws & Pals have delivered a well thought out product which most importantly works well to protect your dog’s teeth and also freshen their breath. Ark Naturals Brushless Toothpaste is a great option for busy owners, as it eliminates the need to brush your dog’s teeth. Instead, you can simply give your pet one of these great-tasting chews and let him go to town. Ark Naturals Chewables feature abrasive ridges on the outside, which help to scrape plaque and food residue from your dog’s teeth, while the inside of the chews contains a patented toothpaste, which will help eliminate tartar buildup and bacterial growth. These chews also feature cinnamon, vanilla, and clove, which will help improve your dog’s breath. Ark Naturals Brushless Toothpaste Chewables are great for owners looking for an easy way to keep their pet’s teeth clean and mouth healthy. Instead of having to corral your dog every night and wrestle with him during the tooth-brushing process, you can simply toss him an Ark Naturals Chewable and let him clean his own teeth. Most dogs love the way these chewables taste and owners were very happy with the way they improved their dog’s breath. A few owners reported that their dog ate them too quickly, which reduced the ability of the chewable to remove plaque completely. Other dogs had trouble digesting because they were too rigid. However, owners found a few ways around these problems. 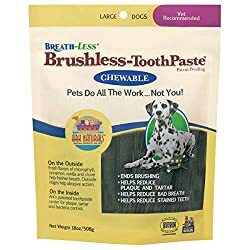 Those with dogs who ate the brushless toothpaste too quickly found that the chewable would last longer if they were frozen before being offered to their dog. On the other hand, dogs who were unable to chew through them had better luck when provided with chewables that were broken into small pieces. Vet’s Best Enzymatic Dog Toothpaste is a veterinarian-formulated tooth-cleaning paste made with aloe, neem oil, grapefruit seed extract, baking soda, and naturally occurring enzymes. It is not only designed to freshen your dog’s breath but to remove plaque and tartar buildup and whiten your dog’s teeth too. You can actually use Vet’s Best Toothpaste in several different ways. You can apply the paste along with a specially designed toothbrush (sold with or without the paste), you can use your dog’s current toothbrush, you can apply it with your finger, or you can simply add a dab to your dog’s tongue. The last two application methods are not very effective for removing plaque or tartar, but they will help freshen your dog’s breath quickly and effectively. If you are just beginning to take care of your dog’s teeth, the Vet’s Best Enzymatic Toothpaste with the optional toothbrush will get you started on the right path. The toothpaste is veterinarian-designed to support complete oral health, by removing tartar and plaque and neutralizing any odors present. Because this product is made in the USA and designed by veterinarians, you can rest assured that it is safe for your pet and likely to work the way you’d expect a high-quality toothpaste to. Some dogs didn’t appreciate the toothpaste’s taste, but others seemed to find it perfectly palatable. The optional toothbrush worked very well for some owners, but others found it to be poorly designed. Fortunately, both the brush and the paste are very affordably priced, so it won’t cost you much to try them.